Convert mobi to epub format is possible. And it's easy! Do you remember Calibre? 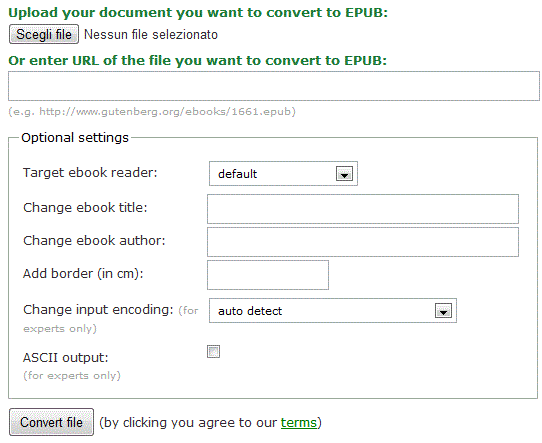 We are going to use it to convert an ebook from the mobi format to the epub one. Download Calibre if you don't have it yet. Follow this simple guide on how to download and install Calibre ebook manager. Open Calibre and you'll find yourself in the main screen. Click on Add Books on the higher left side of the screen and find your mobi ebook if you haven't done it already. Whether you had your .mobi ebook on your library or you added it on the second step it's time to convert it to an epub file. Right click on the ebook and select Convert books -> Convert individually and another screen will pop out. In this screen, on the top-left part you'll find the Input Format that is the initial format of the ebook, in this case is Mobi. If it isn't selected yet, select it. On the other side of the screen you'll find the Output Format that should be Epub in this particular case. Select it. You'll see many other option in the conversion panel but you don't really need those things at the moment. If you want to change the title of the ebook, if you want to correct something, you're able to do it. Since it is not important for us, I'll not talk about it here. Click on Ok and you'll see that on the bottom side of the software there's Job 1. It means that the program is converting your mobi ebook to epub. If you have more than one ebook in the epub format you can easily convert all them all by going back to Step 3 and, instead of selecting Convert books -> Convert individually, select Convert books -> Bulk convert. This is time saving but the quality of the conversion might be a little lower. You did it! Easy isn't it? If you don't have Calibre installed or if you aren't able to install it don't despair. You can easily convert your mobi thanks to an online service called OnlineConvert.com. As you can see in the image on the right you can upload your own file from your computer or enter the url in which your mobi ebook is found. Fill in all the advanced options such as the ebook title and author (be aware of the copyright), if you want to add a border etc. That's it, you made it.